Books: 1) Cambridge History of China Vol. 5 Part One and Part Two (Cambridge University Press); 2) Benn, Charles, “Daily Life in Traditional China: The Tang Dynasty,” Westport: Greenwood Press, 2002; 3) Schafer, Edward H. “The Golden Peaches of Samarkan,” Berkeley: University of California Press, 1963; 4) The Culture and Civilization of China, a massive, multi-volume series, (Yale University Press); 5) “Housing, Clothing, Cooking, from Daily Life in China on the Eve of the Mongol Invasion 1250-1276" by Jacques Gernet (Stanford: Stanford University Press, 1962). You can help this site a little by ordering your Amazon books through this link: Amazon.com. Some of the most beautiful porcelain ever produced was made during the Song dynasty (960-1279), when world-famous monochrome porcelains, including celadon, were produced. Celadon is green porcelain made with a slip and glaze, sometimes with incised and inlaid decorations. It is associated with both China and Korea. Wonderful crazed or cracked glazed pottery, produced by the shrinking and cracking of the glazes due to rapid cooling, appeared during the Song period. The earliest pieces with this kind of glazing were probably made by accident in the firing process but later was developed into an art form that had a great impact outside of China, influencing the famous tea ceremony ceramics of Japan. Ching-te Chen in the Chiang-shsi province (present-day Jiangdezhen in Jiangxi Province) became the seat of imperial ceramic making under Emperor Chen Tsung around A.D. 1000. Porcelain from the imperial plant here was regarded as the best and was reserved for imperial use. 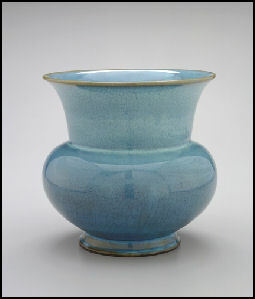 National Palace Museum, Taipei description of Plain narcissus planter with greenish-blue glaze, Northern Sung Ju Ware (height: 6.7 centimeters, Depth: 3.5 centimeters, Rim width: 16.4 centimeters, Rim length: 23 centimeters, Bottom width: 12.9 centimeters, Bottom length: 19.3 centimeters): Known as the only narcissus planter without any crackle to its glaze, the form of this piece is perfect and reflects the appreciation of the Ming dynasty connoisseur Ts'ao Chao, who praised "Those with 'crab-claw' (crackle) patterns as divine, but those without as truly superb". National Palace Museum, Taipei description of Incense burner, Northern Sung Ju Ware (height: 15.3 centimeters, Rim diameter: 23.8 centimeters): Similar to a lacquerware vessel shape of the Warring States and a bronze burner type of the Han dynasty, the robust form here has a strongly classical manner. This type of vessel was included in the list of Ju wares submitted by the favored official Chang Chün to the Southern Sung emperor Kao-tsung. National Palace Museum, Taipei description of Lotus-shaped Pot Stand with Azure and Aubergine Glaze, 13th-14th century (height: 7.3 centimeters, rim width: 22.5 centimeters, base width: 13.9 centimeters): “This pot stand with an everted and delicately foliated rim evokes the shape of a lotus blossom. This shallow vessel with undulating walls echoing the petals has a flat bottom that is supported by three "cloud-head" feet. The thick body and glaze create for a classic, solemn effect with the distinct ridge of the rim. The exterior is covered with a lustrous aubergine glaze, while the glaze on the inside is shiny azure. The color of the rim glaze appears to represent a mixture of blue and purple. The glaze flow under the rim is light purple, and down to the base, it turns blue and brownish in color; the ridges appear brownish-yellow. The glaze on the interior and exterior is marked by "earthworm-track" patterns that are long and continuous. The glaze extends down to the base, which is flat, covered with a brown slip, bears 17 evenly spaced spur marks along the edge, and is incised with the Chinese character for "three (san)." Examples of these kinds of Ding ware in the National Palace Museum collection include: 1) Covered jar with rope motif, Late Tang dynasty to Five Dynasties period, 10th century; 2) Foliate rimmed bowl stand with Guan mark, Five Dynasties period, 10th century; 3) Porcelain ewer with dragon mouth, Northern Song dynasty, 10th century. There are also records of a "Southern Ding" ware, as archaeological excavations have uncovered evidence of a fair amount of conscious imitation of Ding wares at southern Chinese kiln sites like Jingdezhen, Jizhou, Xuanzhou, Nanfeng, Guangze, and Shaowu. The literati of the Ming period (1368–1644) prized Ding wares, and many imitations proliferated; even such imperial wares as Yongle (1403-1424) and Qianlong (1736-1795) white porcelains also clearly reflect a reliance on Ding ware as a model. Examples of this at the National Palace Museum collection include: 1) Bowl with impressed design of pomegranate, plum blossom and the moon, Jingdezhen ware, Southern Song dynasty, 12th -13th centuries; 2) Ewer with wrapper design, Late Ming to early Qing dynasties,17th -18th centuries; and 3) Bowl with impressed spiral and floral design, Huozhou ware, Yuan dynasty, 13th -14th centuries. “The Song people were very serious about proper rituals. The Xuanhe Catalogue of Antiques, a major, comprehensive antiquarian compilation by Emperor Huizong of the Northern Song and his officials, became the guiding reference for the Southern Song in its effort to reinstate the ritual ware system. After verification and correction, new updated diagrams were made and issued nationwide, for all local Confucian shrine temples to consult and follow. The revival of the past and emphasis on rituals are also reflected in contemporary bronzes and jade articles. “Following the Jingkang Crisis towards the end of the Northern Song Period, the Jin Army conquered northern China and the Song emperor hurriedly traveled southwards, shifting the political center of the country to the south. It was highly necessary for the emperor to hold religious rituals and announce to the people the authenticity of the emperor's political powers. During such war-battered times when so much lay in waste, however, it was difficult to obtain well-made bronze or jade ware to serve as ceremonial vessels. The imperial administration therefore ordered that ceramic, porcelain and wooden wares be used temporarily and be mass produced. The initial kilns for making of imperial porcelain were located in Huiji, Suzhou and Hangzhou, with Hangzhou being the main location. Under imperial supervision, the earliest Southern Song imperial kiln porcelain all had standard forms. As these ceramic and porcelain wares were intended to replace bronze ritualistic vessels, some of the early Southern Song imperial kiln porcelain closely resembled ancient bronze vessels. This particular celadon vessel was made to imitate the shape of ancient bronze "Zun vessels". The most exquisite sculpture from the Song Dynasty are wood Buddhas and bodhisattvas. Robert Jacobsen, curator of Asian art at the Minneapolis Institute of Arts said: “[M]any historians agree that the last great moment in Chinese Buddhist sculpture occurred in the late Sung period, in the 12th and 13th centuries. Wooden sculpture at that time is perhaps the best we’ve ever seen.” A fine example of Song wood sculpture at that museum is The Bodhisattva Guanyin (Kuan-yin) made of wood, gesso, and mineral pigments, and gold. “Water dish vessels are used by the literati to hold water for dampening or washing of writing brushes. These vessels are usually placed by the ink stone and are a necessary piece of desk stationery. Intellectual pursuits being so popular during the Song Dynasty, brush wash vessels were naturally fashionable items at the time, not only a practical writing implement but also a work of art for appreciation. Just imagine: as the literati fill this vessel with water, the two turtles would appear as if swimming in the water, playing amongst the lotus leaves; when the brush is washed in the vessel, the ink would flow between the lotus leaves, the black ink perfectly counter-balancing the delicate, green-white jade leaves, adding to the natural interest of the piece.